Travel enriches our perspective on life and how we live it. When we travel whether it is by discovering hidden treasures in our own hometown or by visiting ancient cities in foreign countries thousands of miles from home, it changes us. It is a transformative and inspirational process. In this post, I share three of my favorite European cities: Venice, Paris, and Seville. Each of these magical cities inspired me with their history, culture, art, architecture and design. I’ve translated the beauty of each of these cities into a personal design that captures how those special travel experiences influenced my aesthetic perspective. La Serenissima, as Venice is lovingly referred to, is a sumptuous city of eclectic experiences. 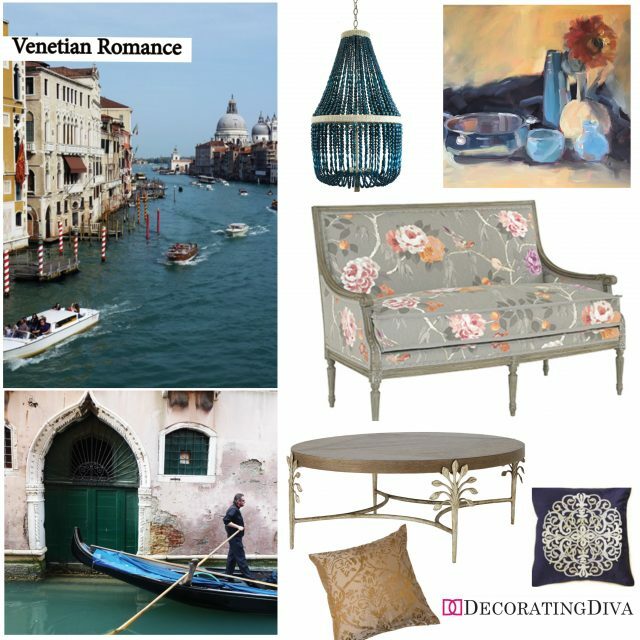 That sentiment is captured in this design that refers to the cool aquatic colors of her celebrated lagoons, the sunny warm terracotta painted palazzos jotting her labyrinth of romantic canals and the beautiful flowers that elegantly dress the balconies of classic Venetian apartments. Décor Resources: Malibu Chandelier – Ro Sham Beaux, Pamela Copeman’s “Silver Bowl” Oil on Panel 9″x12″ Painting, Wesley Hall’s Grantham Settee, Sapling Oval Cocktail Table (Dark) – Ambella Home, Pier One Imports’ Metallic Medallion Velvet Pillow in Navy, and Copper & Gold Printed Silk Pillow – Deborah Main Designs. 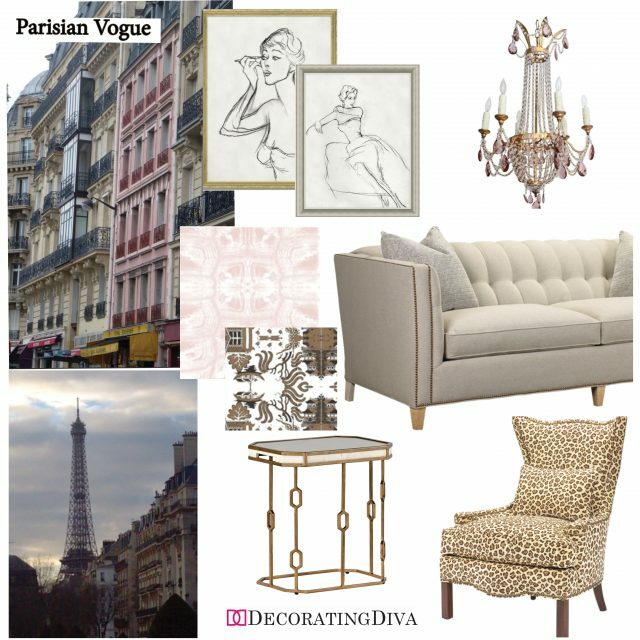 Muted pastels, elegant patterns, classic styling, a strong statement piece dressed in animal print and figure drawing artwork convey the timeless chic that the architecture and citizens of the City of Light is famous for. Décor Resources: “Seated Woman” by Carl Erickson for Conde Nast – Soicher Marin, Empire Form Italian Chandelier with Amethyst Colored Accent Crystals – The HighBoy, “Tortoiseshell” in Pinkish White and “Willow” in White Cafe Noir Designer Fabrics for Custom Decorative Pillows – Root Cellar Designs, Sebastian Sofa – French Heritage Furniture, Gabby Home – Issac Table, and Leopard print “Voltaire” Chair – French Heritage. 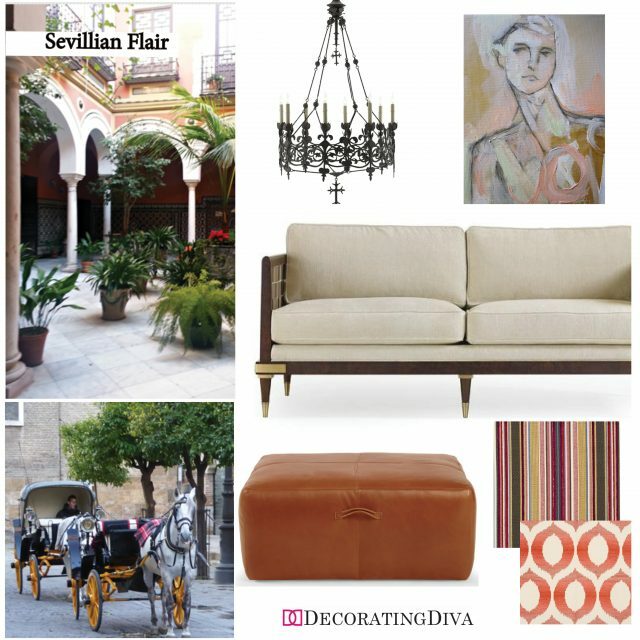 Earth inspired colors, ironwork detailed décor and intricately crafted wood and brass furniture capture the passionate vibe of Seville – a city heavily influenced in its arts, crafts and design by the historical styles of the Romans and Arabs that once inhabited this stylish southern Spanish city. 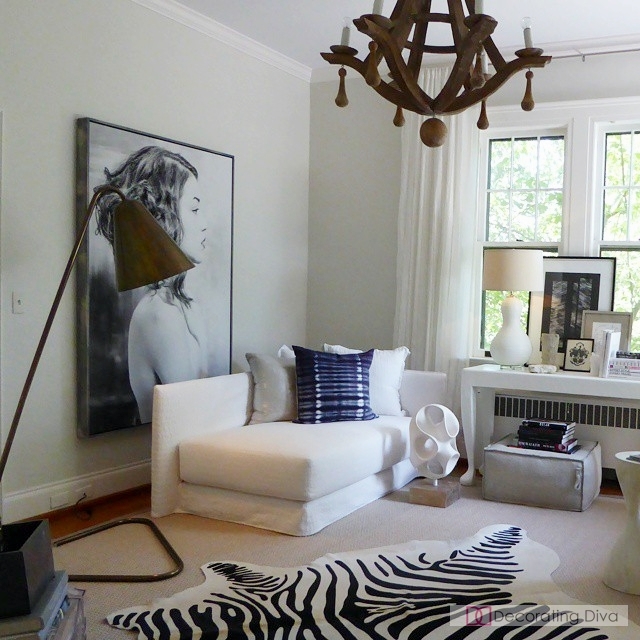 Décor Resources: Porte De Fer Chandelier – Currey & Company, Kerry Steele’s “Portrait of Youth,” Inter-Woven Sofa – Caracole Home, Bernhardt Interiors’ “Denley” Ottoman, and Meredith Heron Color Concepts Crypton – Textiles in “Christopher” & “Meredith” – JF Fabrics.